Kapalua Resort on Maui is a luxury playground for adults and kids alike. Famous for its championship golf courses, the resort offers a luxury hotel, guest villas, three beaches, a tennis center and an array of restaurants. The property is located on West Maui which is sunny and rain-free most of the time. In the winter, be sure to pack your binocular so that you can watch whales right from the beach. This is a golfer's paradise. The two golf courses provide a challenging layout and spectacular views of the Pacific Ocean. The resort offers special programs for kids at the Art School and at the The Ritz-Carlton, Kapalua. 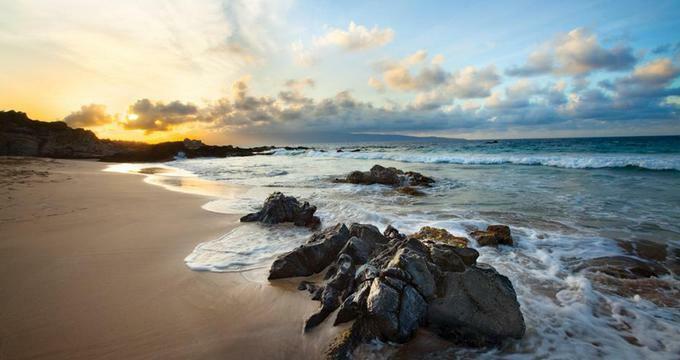 The whole family can enjoy tennis, snorkeling and swimming at one of the three resort beaches: the family-friendly Kapalua Beach, the secluded Oneloa Bay Beach and the D.T. Fleming Beach. Kapalua Villas offer guests access to two championship golf courses, an array of restaurants and three beaches. This is a good accommodation option families who need more space and like the flexibility of preparing their own meals. The one-, two- and three-bedroom villas offer different locations, depending on what you are looking for. The Bay Villas offer easy access to the secluded Oneloa Bay. If you are planning a golf trip, there is a choice of luxury villas overlooking the Bay Course. Guests receive access to 24-hour check-in, bell service, 24-hour Hertz rental car desk and a complimentary shuttle service throughout the resort. Travelers enjoy fully-equipped kitchens, washer/dryer, private lanai and twice-weekly maid service. There are several restaurants at the Ritz-Carlton, Kapalua and at the golf clubhouses. For an inexpensive breakfast or lunch, visit the Honolua Store. There are two luxury Hawaiian spas at the resort. Whether you want to have an elegant dinner or a quick lunch with a view, there are many restaurants to choose from at Kapalua Resort. The three golf clubhouses all have gourmet restaurants. Having a car is not necessary because the resort provides a complimentary shuttle that will take you to all the resort beaches, restaurants and activities. If you decide to rent a car while on Maui, however, the villas offer good car packages that can save you money. Check for Maui packages before booking. Honolua Store is a full-service grocery store. This is also a great place to get an inexpensive breakfast or lunch on the go. Pick up a pizza or a sandwich and head to one of the great beaches in the area. The store offers hot breakfasts, local plate lunches, deli and grilled sandwiches. It is open from 6am to 8pm. Breakfast is served from 6am to 10am; lunch from 10am to 3pm. For more information, call 808-669-6128.